Be the first to share your favorite memory, photo or story of Elyse (McCleaf). This memorial page is dedicated for family, friends and future generations to celebrate the life of their loved one. 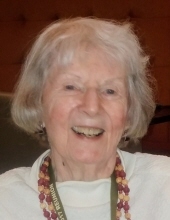 Elyse (McCleaf) Dickert, 92, formerly of Biglerville, PA, died Thursday evening, January 24, 2019 at Hospice & Community Care, Lancaster, PA.
Born November 7, 1926 in Gettysburg, PA she was the daughter of the late William and Catherine (Allison) McCleaf. She was the wife of the late Harvey W. Dickert who died December 5, 2004. Mrs. Dickert was a former member of Trinity Lutheran Church in Arendtsville, PA where she was a member of the church choir. She was a graduate of Gettysburg High School and worked as a secretary for the Penn State Fruit Research Lab. She was a member of the League of Women Voters and the Gettysburg American Legion Ladies Auxiliary. In her free time, she loved playing bridge and reading. Elyse is survived by her two sons, Matthew R. Dickert, of Sterling, VA and his wife Donna and Michael F. Dickert, of Millersville, PA, and his wife Anita; her five grandchildren, Allison Madson, Nathaniel “Ned” Dickert, Sarah Dickert, Philip Dickert, and Bethany Dickert; her sister, Phyllis Chambers, of Gettysburg, PA; and a number of nieces and nephews. She was preceded in death by five sisters, Mildred Riegle, Clara Bushey, Edith Bushman, Jean McCrorie, her twin sister Eloise Wilson, and her brother, William Rolan McCleaf. Funeral services will be held 11:00 AM, Saturday, February 2, 2019 at the Monahan Funeral Home, 125 Carlisle St., Gettysburg, PA with Rev. Ben Siebert officiating. Burial will be in the Evergreen Cemetery, Gettysburg, PA. The family will receive friends from 9:30 AM until the time of the services Saturday morning at the funeral home. Online condolences may be made at monahanfuneralhome.com. "Email Address" would like to share the life celebration of Elyse (McCleaf) Dickert. Click on the "link" to go to share a favorite memory or leave a condolence message for the family.